With this post Inverse Square launches what I hope will be an expanding part of its repertory. The goal of this blog is to probe the intersection of science and public and daily life. That’s a big beat, the biggest — and it is much more than any one person could hope to cover. So with the following work, Inverse Square’s first guest post we see the beginnings of what I would like to see become a community of insight into the ways science penetrates our experience at every level. When my gracious host first offered to let me guest-post on this blog, one thing worried me more than anything else: what would I write about? Could I come up with topics that would interest readers, generate discussion, and actually be informative simultaneously? Sometimes even attaining two out of three is difficult enough. I could lie and say that I don’t know what made me click on this headline and read the article. Yes, I like animals, and I’ve been to the Philly Zoo–as zoos go, it’s not bad, and I went there with my cousin’s kids a few years back. But I’m not particularly interested in animals or zoos. Instead, I clicked on the link because I had a vague impression that something infuriating was waiting for me in the article, and I admit it: I sometimes enjoy getting fired up. Hey, sometimes getting angry about something is the first step toward improving a situation. A few weeks ago, Philadelphia Zoo keeper Mandy Fischer heard a small cough. It was Spot, 25, a grandmother and matriarch of her group of spectacled langurs. X-rays and ultrasound showed that the elderly Asian primate is not just losing her teeth. She has advanced cardiac disease. Philadelphia has adapted living spaces for the elderly. A tree kangaroo that could no longer climb her pole got handrails and ramps. A snow leopard with failing vision got brighter lights. The study found that vulnerable elderly patients — those at risk of death or functional decline — received only 65 percent of tests and other diagnostic evaluations and treatments recommended for a number of illnesses and conditions, including diabetes and heart disease. And less than a month after running the homegrown story about the Philly Zoo animals, the Philly press picked up an AP story detailing the impending crisis (note to AP: I came up with that phrase before I noticed that it was part of a quote in your story; please don’t sue me) in geriatric health care. In brief: there’s a shortage of geriatric specialists; there’s a shortage of available training; most of the people who DO work in the field are underpaid and stressed with a workload of too many patients; and Medicare doesn’t allow for a lot of the treatment and care that its patients require. [Rosen] reported that as of 2002, only 5 percent of social work practitioners listed aging as their primary area of expertise, and that only 1,115 Masters-level social work students specialized in aging. In contrast, the [National Institute on Aging] issued a report nearly 20 years ago emphasizing the need for 60,000 to 70,000 social workers specialized in aging by 2020. Despite two decades of warning, experts fear that the actual numbers will fall drastically short of the predicted need. Rosen also cited shortages in the number of psychiatrists providing specialized care for the elderly. At the time of her testimony to the White House conference, less than 7 percent of the 38,691 practicing psychiatrists in the U.S. specialized in aging. According to Rosen, given the existing trends in medical schools and the retirement of current practitioners, there will be 5,682 older adults with psychiatric disorders for every one geriatric psychiatrist in America by the year 2030. Meanwhile, kangaroos get ramps and handrails, emus get X-rays and arthritis medication, and I get really, really ticked off. 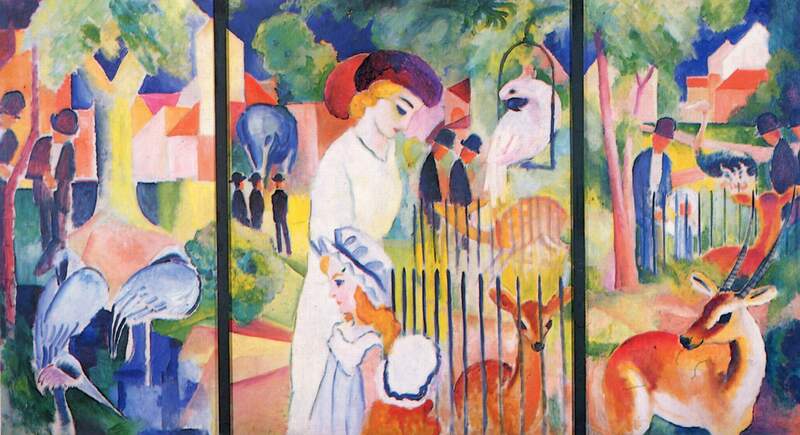 Image: August Macke, “Great Zoological Garden, Triptychon,” 1913. The reproduction is part of a collection of reproductions compiled by The Yorck Project. The compilation copyright is held by Zenodot Verlagsgesellschaft mbH and licensed under the GNU Free Documentation License. Source: Wikimedia Commons.